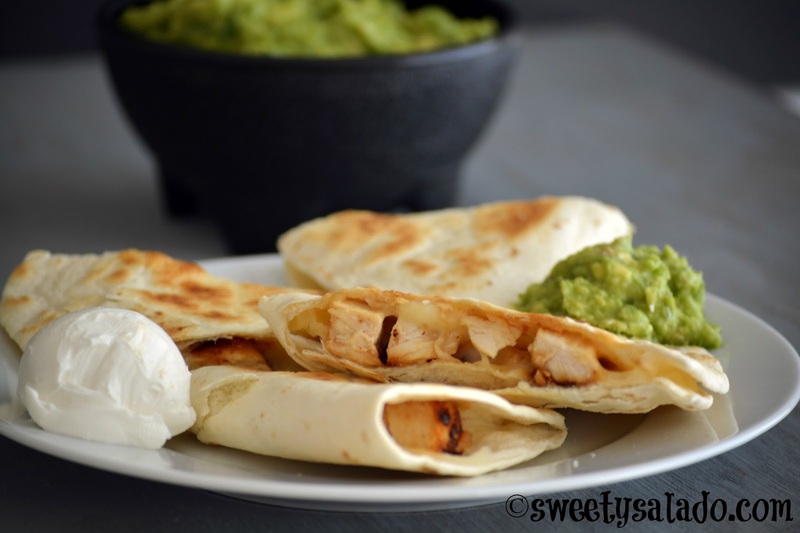 A simple recipe that you can make for breakfast, lunch or dinner is a delicious quesadilla which I make often at home whenever I don’t feel like making a big meal. Like I have said in previous posts, in Colombia we usually use arepas for quick meals like this one but here in the US, I can easily buy all kinds of different tortillas at the grocery store and I’m good to go. A basic chicken quesadilla will only have cheese and chicken but if you want to make it into a full meal, you can also add sautéed peppers, onions, jalapeños, mushrooms, any kind of vegetable that you want. Plus, you can serve it with rice, beans, guacamole and pico de gallo on the side. Children usually eat it with just cheese because they can be really picky about adding anything else. You can also spread a little bit of butter on the outside of the flour tortilla to give it a buttery taste but I prefer not to do it. What I do like to do is use butter flavored flour tortillas for making my quesadillas because they have a delicious, soft buttery flavor. If you have never seen them, then you need to try them because they are AMAZING! Here in the US you can usually find them at most Mexican grocery stores. Season both sides of the chicken breasts with garlic powder, onion powder, ground cumin, chili powder, paprika, salt and pepper. Heat the oil in a large pan on medium high heat and cook the chicken breasts for about 5-7 minutes per side or until they're done. Remove them from the heat, let them rest for about 5-10 minutes and the chop them into small cubes. You can add about 1 tbsp of oil to the same pan and cook bell peppers, onions, & jalapeños for about 3-4 minutes to add to your quesadillas. To assemble the quesadillas sprinkle some shredded cheese to half of the tortilla, then add the chicken (and vegetables if you want) and finish with another layer of cheese on top of the chicken. Fold over the tortilla and cook uncovered in a large pan on medium low heat for about 2-3 minutes per side or until the cheese is melted. 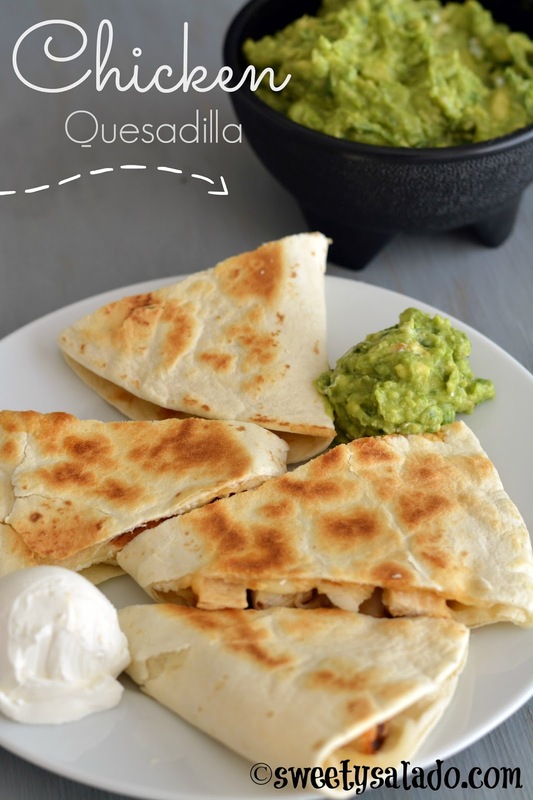 Cut the quesadillas into 4 wedges and serve with guacamole, pico de gallo and sour cream on the side.